I had studied music in the 1950's and 1960's. The arrangements are accessible and every once in a while they throw in some interesting chords. I find both the first and the second books a great way to keep me engaged in practice. I have played out of many song books and these are by far the most gratifying. I heavily debated the rating to give this book. I take both books with me on the road and on the water in my cruising sailboat and find them wonderful companions. Started looking through it, and had to grab my ukulele and play several songs!! You can find a complete song list on The Daily Ukulele website. I'm a beginner, having played for less than a year, but on the first read through, I found at least 10-15% of entries immediately playable and fun. Let me repeat, yes, the 366 has harder songs, so I would recommend that a person start with the 365! Each song has the melody notes so even if you haven't heard it you can figure it out. Just like the first Daily Ukulele book, all arrangements feature melody, lyrics and ukulele chord grids in uke-friendly keys. Either book by themselves are great, but if you want more, then get both! This may be because they have more experience with playing the ukelele or more familiarity with some of the songs. Look at me, I'm playin the ukulele!! This super collection features 366 more well-known songs arranged for ukulele from the 1950s through today, by artists such as Carole King, Elton John, the Bee Gees, Stevie Wonder, the Beatles, Paul Simon, Bob Dylan, Michael Jackson and others, plus favorites from movies, Broadway, Motown and more! Also, many songs are incomplete. Then we moved to this one. But if you're looking to get this in addition to the other volume, for like 20 bucks, I'd say go for it. I especially like the additional chords that are used in the Leap Year edition. I guess beginning ukulele players are charmed by the catchy title and assume that some of the badly chosen chords don't sound right because of their own playing. 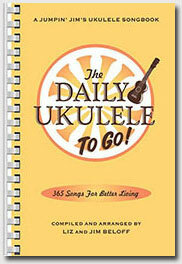 Book Summary: The title of this book is The Daily Ukulele - Leap Year Edition and it was written by , , Creator. The only criticisms I may offer are that I think some of the tunes are a bit old and outdated for my liking. Great selection of songs, I keep finding songs I didn't think I knew, but actually do- yes, there are a few obscure songs, but compared to all the other great songs, I'm totally willing to weed through. 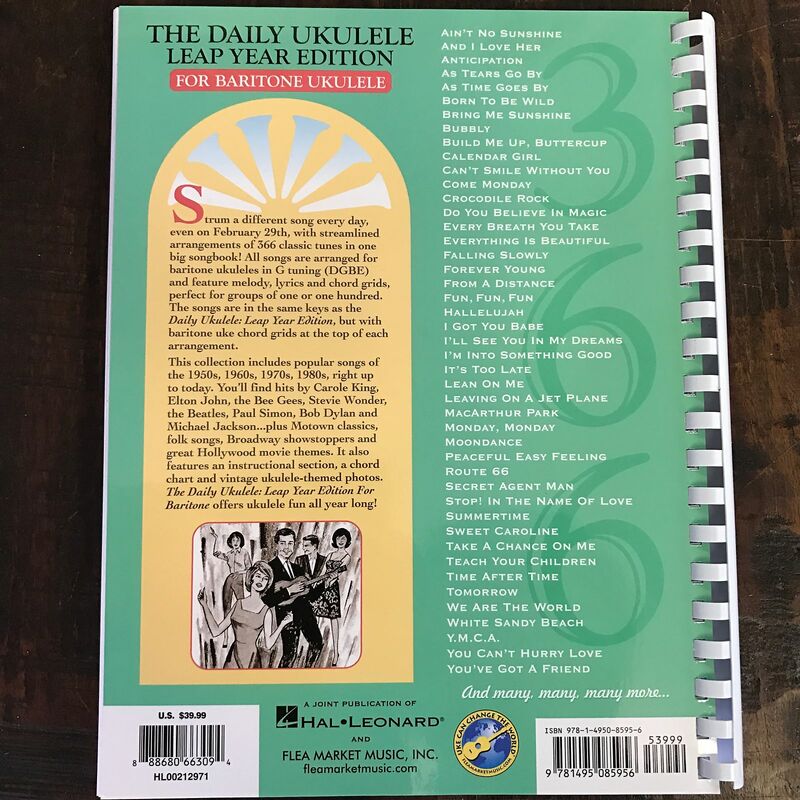 Just like the first Daily Ukulele book, all arrangements feature melody, lyrics and ukulele chord grids in uke-friendly keys. All in all, a big, fun book! This makes the pages difficult to turn. It is fun and a challenge to learn new chords. Both books have a large assortment of songs with lyrics, tablature chords and clearly printed. This super collection features 366 more well-known songs arranged for ukulele from the 1950s through today, by artists such as Carole King, Elton John, the Bee Gees, Stevie Wonder, the Beatles, Paul Simon, Bob Dylan, Michael Jackson and others, plus favorites from movies, Broadway, Motown and more! I was floundering before I got the 365 and not very motivated to practice. I just purchased a second copy of the Leap Year edition as a Christmas gift for a uke-buddy. Much easier to carry around as well. There are a few two-chord songs for a person to start on, also three-chord songs, and it goes on to more. No up to date modern popular songs of the 1960's and 1970's. Also, the plastic comb binding itself is of a much higher quality than that of the first book. I cut my teeth on both of the big beloff books; sit and play through these and you will get an excellent grasp of Uke playing and the western cannon of popular music. I like this fake book as well as the first one I bought. Just like the first Daily Ukulele book, all arrangements featu Fake Book. All have a list of the song's chords in tab visuals at the top, then each chord name is listed above the measures as you play to indicate where you transition. As other reviews have mentioned, I tinker with the chords when they don't quite fit. So we have to turn the pages slowly with caution so as not to tear them from the binding. I was hoping for more songs from the twenties and thirties when the ukulele took the mainland by storm. The Daily Ukulele: Leap Year Edition offers ukulele fun all year long even on February 29th! However, compared to the first book, I was a bit disappointed in the selection of songs in the Leap Year edition. I am a librarian and could not find any good uke music books in our collection, not even through Interlibrary Loans. I frankly took mine apart and put it in a 3 ring binder because I transposed so many of the songs so I could sing them. I have played guitar for many years, but the ukulele is a new instrument for me. Personally i think they are pretty poorly slapped together. What a great collection of standards and traditional, familiar music. Both books have a large assortment of songs with lyrics, tablature chords and are clearly laid out. I bought this after owning the original Daily Ukulele book for a year, and it's a great companion. Now we have both books 365 and 366 and I absolutely love, love, love them! I have played out of many song books and these are by far the most gratifying. True, some of the songs Specifically Hallelujah by Leonard Cohen are in odd keys. I was so happy to see so many older songs that sound so great on the uke.